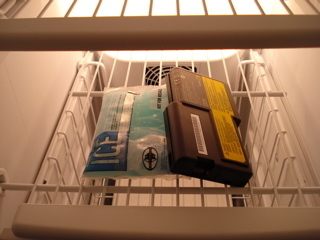 Our good friends at lifehacker spotted this suspicious tip for reviving a dead laptop battery over at Metacafe. According to the posted video, freezing the battery can help to rejuvenate it. I think it's pretty unlikely this has much effect one way or the other, and of course "dead" comes in different flavors. I have a battery right now that was practically new and suddenly it's totally and completely dead, like it blew a fuse or something. A freezer isn't going to make any difference for that problem. But if it's just not holding its charge as long as it used to, as all such batteries eventually do after a year or so, then there is at least the theoretical possibility that freezing it might have an effect. As fas as what I've read on battery technologies, though, I've never seen the freezing recommendation mentioned as a possible method for increasing the life of different battery systems." This is a mith, I did that when I was 6 years old! I think this is because the battery fails when it´s hot and when you lower the battery temp, you can used it again.